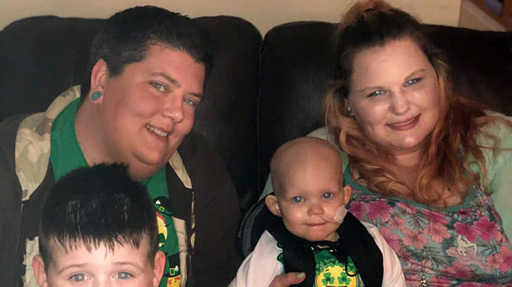 Diagnosed in January with stage four Neuroblastoma, little Callie Shaffer has already spent more than 100 days in the hospital undergoing rounds of chemotherapy as well as surgery to remove a cancerous tumor. "My prayers for Callie. 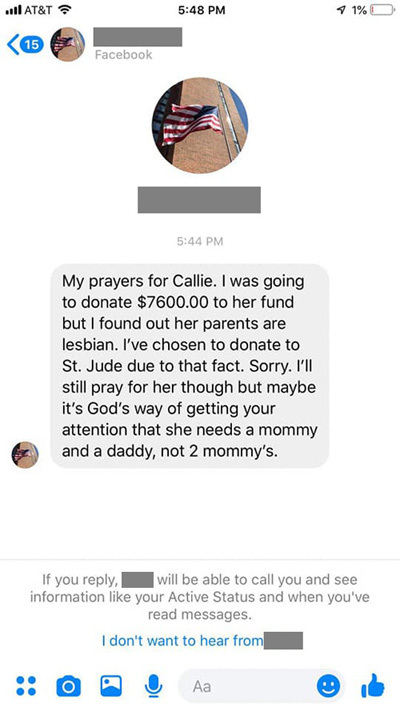 I was going to donate $7600.00 to her fund, but I found out her parents are lesbian. I've chosen to donate to St. Jude due to that fact. Sorry. I'll still pray for her though, but maybe it's God's way of getting your attention that she needs a mommy and a daddy, not two mommies." Callie’s parents shared a screen capture of the comment on their Facebook page. “This is a very sick little girl, who's life is on the line," read the parents' caption. "That's mainly what it was -- shock and hurt at the same time,” said the mother. “She's loved. She's being taken care of. Why does it matter?,” added Callie’s aunt, Trisha Lamb. “Why would you want to hurt someone who is already hurting?" A GoFundMe campaign has been launched to help defray the costs of the expensive treatment.